Thanks to the state's open records laws, Georgia Politics Unfiltered has obtained a copy of the filed complaint to Democrat Richard Anson's candidacy made by the Dougherty County Republican Party. Anson was named as the Democratic Party's candidate for the district 1, Dougherty County School Board seat after Judith Corbett, the winner of the July 15th Democratic primary, withdrew from the race. 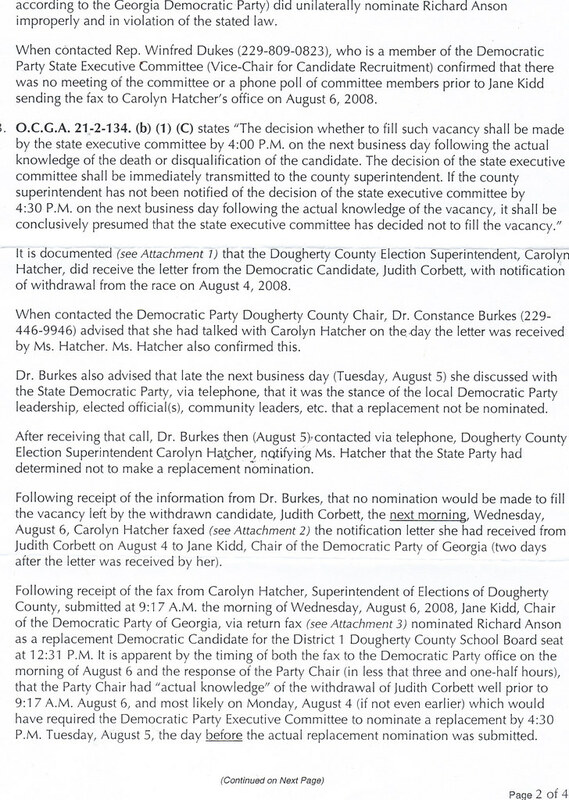 On September 9th, a letter was sent to Secretary of State Karen Handel by Dougherty County Republican Chair Karen Kemp requesting an investigation into the manner by which Anson was placed on the Democratic ticket as the substitute nominee [Click here to see the Dougherty County GOP's complaint: page 1; page 2; page 3]. 4. 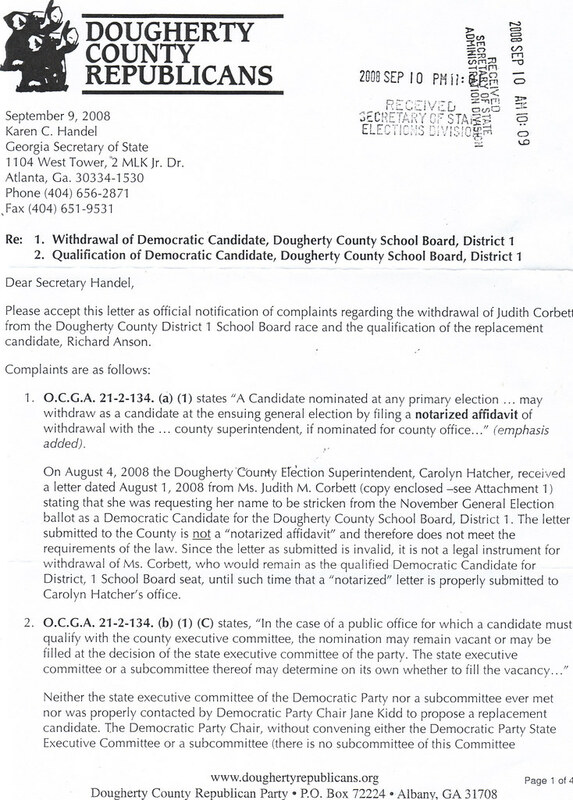 The faxed nomination letter submitted by Jane Kidd to the Dougherty County Elections Office on August 6, 2008 was improper in that it is required to be signed by both the chairperson and secretary and contained no proof of being sworn to by either person before an officer qualified to administer oaths. 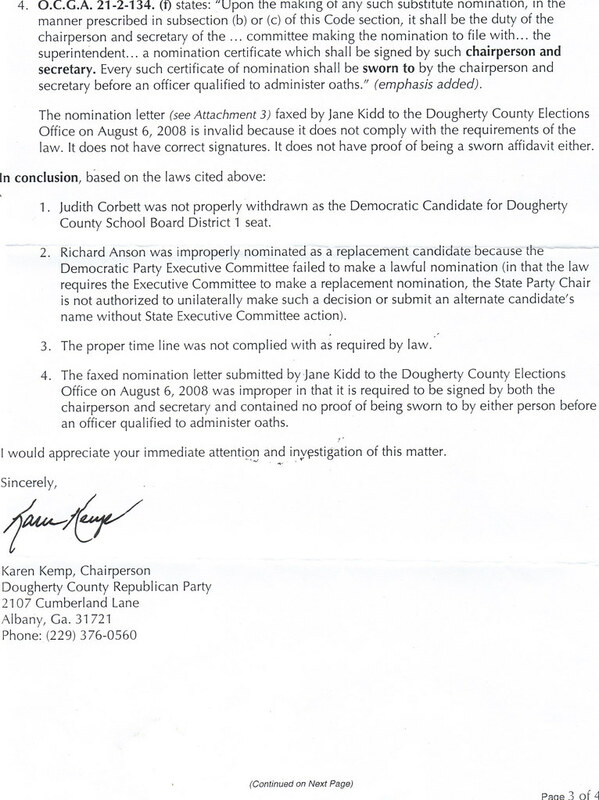 Dougherty County's Republicans say the second part of their complaint --that Jane Kidd unilaterally placed Richard Anson's name on the ballot without the state Democratic executive committee's approval-- is backed up by state Rep. Winfred Dukes (D - Albany), a member of the Georgia Democratic Executive Committee. "When contacted, Rep. Winfred Dukes, who is a member of the Democratic Party State Executive Committee (Vice-Chair for Candidate Recruitment) confirmed that there was no meeting of the committee or a phone poll of committee members prior to Jane Kidd sending the fax to [Dougherty County Elections Superintendent]Carolyn Hatcher's office on August 6, 2008," the complaint reads. When asked if the section of the Republican Party's complaint that mentioned him by name was accurate, Dukes said he had no comment. The Dougherty County Republican Party's challenge, if successful, would remove Richard Anson from the district 1, Dougherty County School Board ballot and put Judith Corbett back on the ballot based on the local GOP's claim that Corbett did not properly withdraw from the race.